Kathryn Bigelow’s newest film continues her exploration of our post-9/11 world. Zero Dark Thirty follows one woman’s intense obsession with tracking down and killing Osama bin Laden. While it may still feel too early for a film about this event, which only occurred a little over a year ago, Bigelow and screenwriter Mark Boal had been working on this bin Laden obsession story before his actual death (which would actually force them to change how the film would end). Yet regardless of how you feel about the actual events, this film will draw out the obsession-driven part of you. When the film opens circa 2003, Maya (Jessica Chastain) arrives in Pakistan as a green CIA agent tasked with finding bin Laden and other al-Qaeda leaders. She is quickly exposed to an extreme torture scenario as she watches her new mentor Dan (Jason Clarke) interrogate a prisoner. Maya looks deeply uncomfortable in this setting, but once she gets back to the office she feels more at home. Yet as the years go by and the hunt continues, Maya’s determination grows, as does her confidence, when interrogating prisoners. She soon becomes even more detached than Dan, possibly because she has other men to do the actual torture while she shouts questions at them. Dan’s disillusionment leads to him to leave the field and return to DC. He isn’t the only one that leaves Maya, who begins to outlast—and outlive—everyone stationed in Pakistan. Leads come and go, but Maya’s obsession grows and manifests itself in many unhealthy ways (especially as concerns her diet). Soon she is the real-life Carrie Mathison from Homeland, but when she thinks she’s found bin Laden we are more inclined to believe her because she is not bipolar (like Carrie). Of course, convincing her bosses that she’s found him is not an easy task. Jessica Chastain is perfect as Maya. She can exude the strength and confidence she feels while also showing her vulnerability when devastating events occur. As her obsession takes over, Chastain balances the line between driven agent and full-on crazy. Her intense and heartbreaking performance sets her apart from most of the lead actresses of the year (hopefully leading to some Oscar gold!). The other actors in the film are great in their smaller roles as well. Jennifer Ehle, Harold Perrineau, and Kyle Chandler do their best to balance Maya’s ferocity. And Mark Duplass, Stephen Dillane, John Barrowman, and James Gandolfini pop up as various CIA characters in the same fashion that Argo is replete with TV-actor cameos. You are in good hands with these actors, and they give the film all the credibility you need to believe in the story and in Maya. The film covers a lot in its 3-hour span, but it manages to infuse small moments of humor to relieve a lot of the tension felt from the terrorist attacks that are constantly occurring in the film. You should never feel too comfortable when watching, because an explosion occurs at least once every thirty minutes. Yet the film never gets as intense as The Hurt Locker (or that climactic sequence in Argo), making it easier to sit through. The tension lies more in the mind, as we follow this great manhunt. 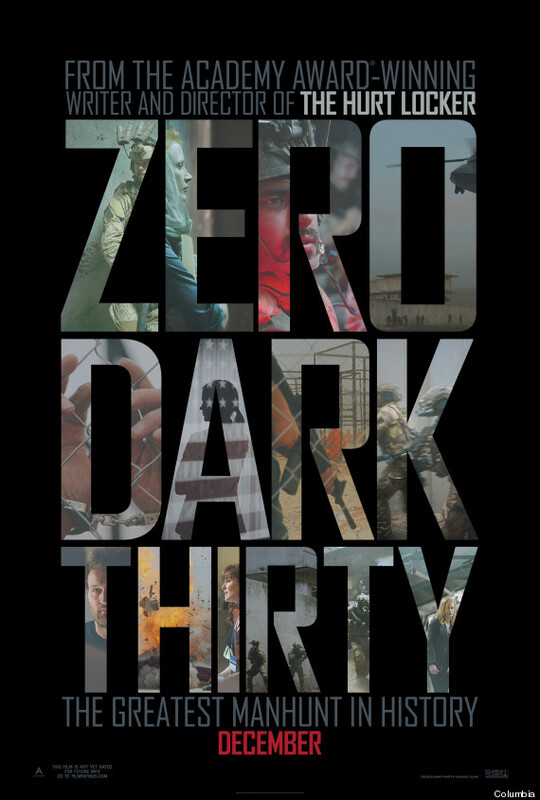 Bigelow, Chastain, and Boal are names you’ll hear thrown around a lot in the next few months as Zero Dark Thirty continues to rack up award nominations. Of the “Big 5” films of 2012, I definitely believe this one is the best. Even if you don’t care about bin Laden or the War on Terrorism (like me) or already feel fulfilled from marathoning Homeland (also, like me), this film is still intensely engaging and thrilling to watch. Although Zero Dark Thirty is certainly not my favorite film of the year (there were so many great ones! ), I definitely feel that this was the best film of the year.